Luxury is a consumer journey from initial excited acquisitiveness, to show off status, through to experienced, contemplative calm. Somewhere in the middle are consumers who use their wealth to buy brands that tell insider stories. Through artist collaborations, these brands - and by association their consumers - become doyens of culture. Many of these collaborations are limited editions with a finite life span – a nod to Andy Warhol's “15 minute” promise. Some brands are lucky enough to have an artistic association in their heritage, just waiting to be unveiled and leveraged. In 1981, Andy Warhol was in New York, and ran into the so-called 2,000 Club. He noted in his punctuation-light diary "a club of twenty guys who got together and they're going to buy 2,000 bottles of Dom Pérignon which they will put in a sealed room until the year 2,000 and then open it up and drink it and so the running joke is who will be around and who won't..."
Given this genuine artistic link, the grande marque champagne commissioned Central Saint Martin's College of Arts and Design to reinterpret its bottle Warhol style. 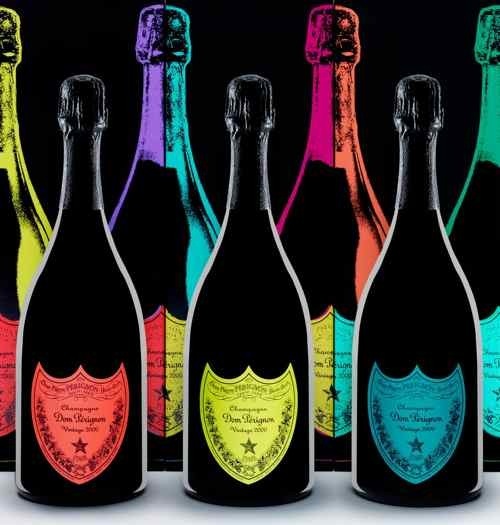 The result was a unique collection of three bottles, each with its distinct label in red, blue or yellow, paying homage to Warhol’s work. Packaging that pops even before the bottles are opened. (See picture below). Other brands select an artist who offers a good fit with their brand and aspirations. Baileys in Russia appeals to urban female drinkers who lead an active social life and choose brands primarily to demonstrate their status. With Russia becoming a dark (no advertising) market for alcohol, there is a need for packaging to create sensational displays and PR news. A limited edition created in collaboration with an artist can be an engaging and powerful combination. With an appropriate choice of artist and activity around the limited edition there is an opportunity to help consumers on their luxury journey to become more in-the-know and cultured. With this in mind, Diageo selected winner of British Luxury Jeweller of the Year Stephen Webster because many of his designs have a Celtic touch in tune with Baileys Irish provenance and Celtic roots. He created an exquisite armband with Celtic curves layered in gold, and set with 1250 brown diamonds and a tourmaline drop. The bottle design translates the piece into a visually spectacular and intricate example of decorative technique. A jewelled bottle to have and to hold. The limited edition created tremendous PR coverage and acted as the centrepiece to several celebrity and fashionista parties. The launch party, held at the Garage Centre of Contemporary Culture in Moscow further reinforced the artistic credentials of the collaboration. Absolut is a brand with a number of cool artistic collaborations to its name. In their city-specific series, Absolut London depicts key characters from the past who have shaped London’s fashion scene. Who better to draw them in his distinctive edgy style than Jamie Hewlett of the Gorillaz. More recently Absolut Mexico has been created by Oaxaca based tattoo artist Dr Lakra. Celebrating the spirit of Mexico, Dr Lakra’s images use icons from ancient Mayan culture depicted in a vibrant Mexican colour palette. However, it is critical brands do not merely ride on artists’ coattails, either in reality or perception. Rigorous relevance is essential. The key to success is to know what your brand stands for, and to ensure that cultural collaborations are not only meaningful and aspirational, but also on-brand.